The water is dropping slowly and is still cool . 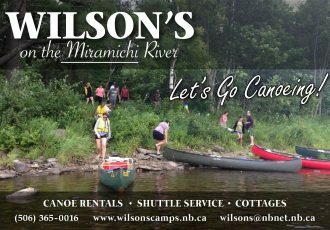 The Miramichi is experiencing some of the best fishing we have seen in years . We are hooking a good number of large salmon combined with what appears to be a huge grilse run . The fish are still on a fast paced migration up stream so you might have a pool full jumping and rolling one moment then an hour later they are gone again , but just be patient there will be another bunch move in . Seems like if he does not hit hard on the first roll then that one is not likely to come back , they are on the move for sure . Green machine with white tail is working but so is almost anything you get in front of a “taking fish”.